Contact Us to Book!Fill out the contact form and get in touch. We will reply in a jiffy! Located on the northwestern part of Sabah, the Kiulu River graded is graded I – II. These gentler grades are ideal for children, novices and the mature adventurer. After your transfer from KK, your white water adventure starts with a safety briefing session conducted by the professional rafting guide. 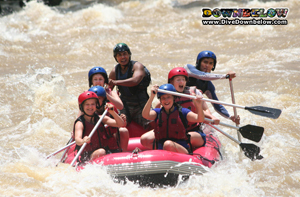 The rafting session covers up to 15km taking about 1 – 2 hours before reaching the ending point where a delicious barbecue lunch is prepared on the banks of the conquered river. 10:30 Rafting commences. Excursions takes about 2 hours to the ending point. Rafting the Padas River is now more adventurous than you can imagine. It’s more fun and exciting and promises you a trip that you will never forget! Ending point is at Rayoh Station from where participants board the train. 13:00 Reach Rayoh Station where a local lunch is served. Note: Participant must be physically fit, not suitable for the NON Adventurous. Minimum Age: 12 yrs old. 1) Kindly be advised the train (used since the late 19th century in Borneo) during your trip is a basic public train therefore expect to share the ride with local villagers and other rafters. Also, train’s arrival and departure schedule may change from time to time as it is operated by the government railway authority. Hence, should this occur please expect a longer waiting time at the point of departure as well as on the overall overland journey – your itinerary will have to be adjusted to accommodate the changes. 2) There may be a possibility that your Padas White Water Rafting Program may be cancelled on the morning of your activity due to unforeseen circumstances (ie. landslide, railway track’s sudden maintenance, train breakdown, etc). Should this happen, you may either re-schedule to another day should you have another day available or change your activity to Kiulu White Water Rafting (Grade I – II) where a refund will be given based on the difference of the programs. Should you decide to not proceed on both alternatives, a full refund will be given on your rafting day. 3) Your in-water Rafting activity will be thoroughly guided by a certified professional raft guide/master with years of experience. During your travel to and from the Rafting Starting and Ending Point he/she may not be immediately available to you therefore please do familiarize yourself with the rafting team upon pick up and do not hesitate to approach any members should you require assistance and guidance during this time. If you would like to book this tour, please send us an email, call our office number or hotline, or drop in at our office in KK Times Square in Kota Kinabalu. All our contact details can be found on our Contact Us page.